ACTIVETRAVEL ASIA's Blog: Vietnam one of attractive destinations for tourists in 2013. 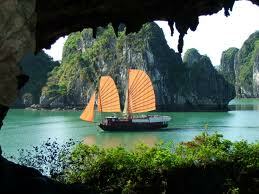 Vietnam one of attractive destinations for tourists in 2013. Vietnam ranked second in the list of attractive destinations for foreign tourists in 2013, according to a recent survey conducted by the United States Tour Operators Association (USTOA). The results were announced at the USTOA’s annual conference in Hawaii on December 25. Myanmar, Vietnam, and India are three most-favoured destinations, followed by Peru, Cambodia, Brazil, China, Colombia, Costa Rica, and Ecuador. In the USTOA’s 2012 survey, Vietnam tops India, Ecuador, and China in the list of emerging tourist attractions. Since the beginning of this year, Vietnam has welcomed more than 6.6 million foreign visitors, up 9.6 percent over last year. The USTOA consists of major travel agents and tourism service providers around the globe.